Local (In State) move or relocation is the most common service we provide. Usually these are quick, painless, and easy jobs ranging from a couple of hours to a day. 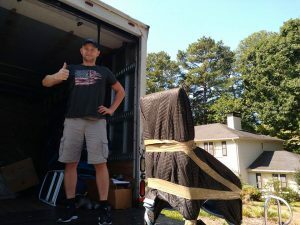 If you are just looking or already need to employ services of a professional moving and packing company you have certainly come to the right place. Whether it’s moving some minor stuff such as a sofa, or a piano to a truck load we’re willing to be there every step of the process and make life easy. You can stay focused on the things that matter to you while our professional and experienced movers do what they do best! One of the best benefits Easy Florida Moving LLC is able to offer our customers besides great service are very reasonable rates. Since we are ourselves located in Miami Florida our travel time to you is minimal and hence you don’t pay for overhead related travel expenses. Our strategic location also allows us to be punctual and meet very strict time frames, which are very important if you’re looking for business or corporate movers. We can also provide all the packing materials you need for your move (some packing cost extra). Our most commonly serviced local (In State) areas are Miami-Dade, Broward, and Palm Beach, for which our travel time fee is always fixed to 1 hour regardless of the actual time is takes for us to get there.